*Blood Pressure Training Arms with a putty colored connection cable can be used with a VitalSim Control Box directly. In order to use this trainer with a SimPad System, an adapter cable will be needed [200-30450]. 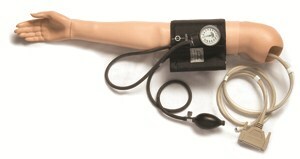 *Blood Pressure Training Arms with a black connection cable can be used with a SimPad System directly (no adapter cable required).